I made this cake for my Son's Birthday! 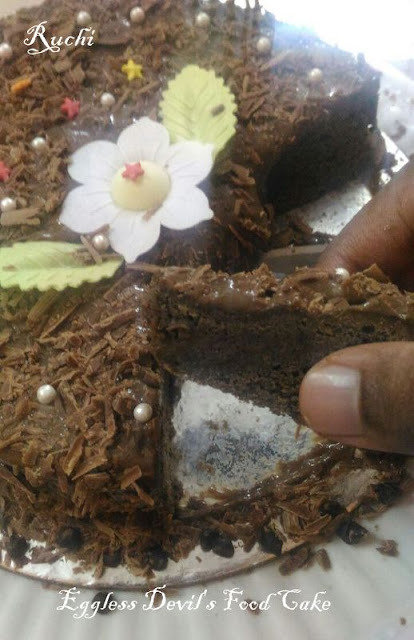 This moist, fluffy and rich chocolate cake is simply the most came out really good. It was soft and super delicious . 2.In a saucepan, add water, milk and instant coffee granules. Heat it until you see small bubbles forming on the rim of the mixture. 3.Remove from the stove and allow it to cool down for 10 mins. 4.In a bowl, cream together butter and sugar until it becomes creamy and is well combined.ThenAdd vanilla extract and mix. 5.In a separate bowl, lightly mix all the dry ingredients (all-purpose flour, baking powder, baking soda, cocoa powder and salt). 6.Once the coffee mixture cools down, Now add half of the dry ingredients and half of the coffee mixture to the butter mixture and combine well. 7.Once combined, add rest of the dry mixture and coffee mixture and combine well. 8.Bake the cake for 20to 25 mins or until a toothpick inserted comes out clean. 9.Once done, let the cake cool down in the pan for 10 mins and then place them on a wire rack to cool completely. 1.Cut the chocolate into chunks and add it to a bowl. Sprinkle instant coffee powder over it or the brewed coffee. 2.Bring the cream to a boil. Switch off as it starts to boil. 4.Whisk furiously to form a smooth & glossy frosting. Let it cool completely. 5.When the chocolate is not runny and is little thick, it is ready for frosting. Place one layer of the cake on a cake stand. Add some ganache and spread it on the layer. Put the other piece cake on top of the frosted cake. Add some ganache on top of the cake and once done, frost the sides.And it’s done. Garnish with chocolate shaves and chocolate chips. Just refrigerate the cake for an hour so that the ganache sets. Serve this mouth-watering cake !